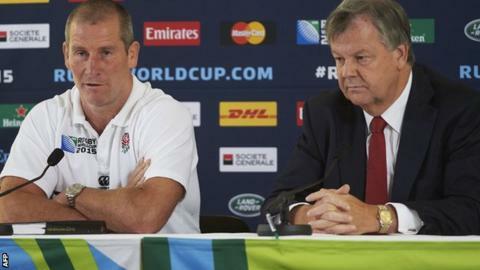 Rugby Football Union chief Ian Ritchie should "not be allowed anywhere near" the review panel into England's World Cup failure, says Sir Clive Woodward. Ritchie was responsible for handing current head coach Stuart Lancaster a six-year contract in October 2014. Ritchie will lead a five-man panel, set up after England became the first hosts to be eliminated in the group stage after finishing third in Pool A. "I was staggered," England's 2003 World Cup-winning coach told the Daily Mail. Woodward added: "Ritchie has overseen England's worst World Cup and over the last four years has got far too close to the team for a man with zero experience or knowledge. "He should not be allowed anywhere near the review, let alone leading it and choosing the panel." Ritchie is responsible for the composition of the panel, which also includes former Lions coach Sir Ian McGeechan, World Cup winner Ben Kay, former Football Association chief executive Ian Watmore and Professional Game Board chairman Ian Metcalfe. Woodward said: "Sir Ian McGeechan and Ian Metcalfe are conflicted, having helped select Lancaster four years ago. They are joining the panel with their minds already made up." England were beaten by Wales and Australia. in the group stages of the World Cup. Woodward said: "Selection was a big problem for England on the field at this World Cup and that malaise is evident off it, too. In fact, the parallel is scary. "The make-up of the panel highlights a conflict of interest by those selecting it. It is defensive, unimaginative and slow, with a clear remit of trying to limit the damage and paper over cracks they and their friends created."